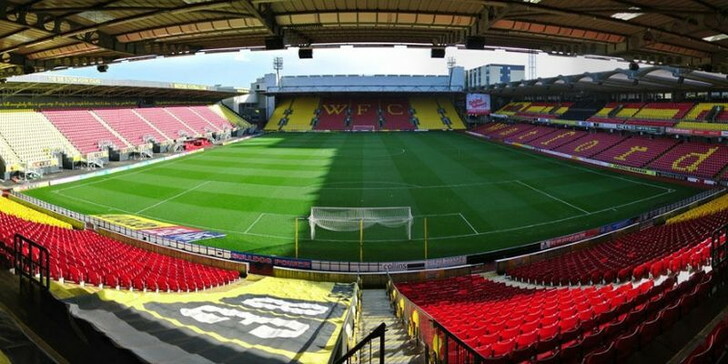 Watford have been at Vicarage Road since 1922 when they left their previous ground, Cassio Road, to head to a new home. The club has also had a long-standing relationship with a giant amongst giants of the music industry, Sir Elton John. The lifelong supporter of the club became its chairman in 1976 and has maintained an active role in club affairs ever since. He even has one of the stands named after him in recognition of his work on behalf of the club. The club gained promotion to the Premier League at the end of the 2014-2015 season after finishing second to Bournemouth, missing out on top spot by just a point. It was the first time Watford played in the top flight since Aidy Boothroyd managed them there in the 2006-2007 season. 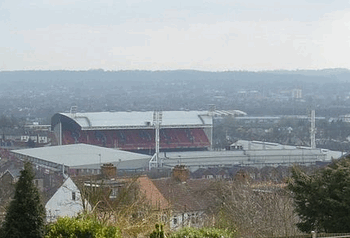 Vicarage Road, which was originally owned by Benskins Breweries and has hosted greyhound racing and horse shows in the past, welcomed Premier League fans back for the first time in 8 years for the 2015-2016 season. 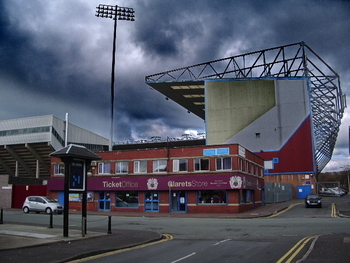 Vicarage Road is a traditional four-sided ground with open corners. There is no running track or anything around the perimeter of the pitch, so the atmosphere can be quite intimidating for the opposition as they have no room between where they’re playing and the fans are sitting. 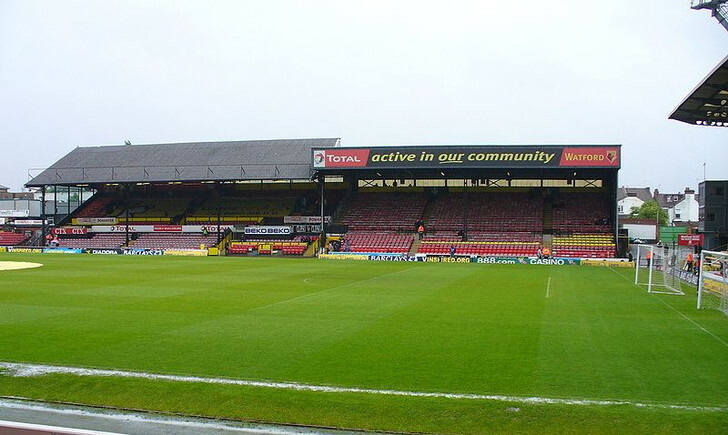 Vicarage Road Stand - Named for its location along Vicarage Road, this stand used to be little more than a bank of earth. In 1993 the open terrace that stood there on top of the bank of each was rebuilt to make it an all-seater stand. It now houses the away fans in one half and the family section of home supporters in the other. 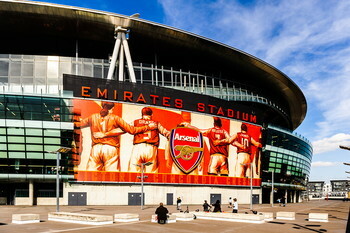 It also houses disabled supporters from both home and away clubs. 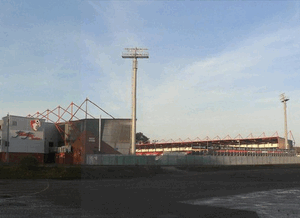 The Rookery Stand - This two-tiered stand was completed in 1995 at a cost of around £1.6 million. The stand also incorporates 164 units of affordable housing for the local community. 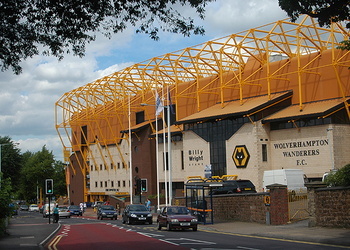 It is the ‘home supporters’ stand’ and houses the most vocal Watford fans. 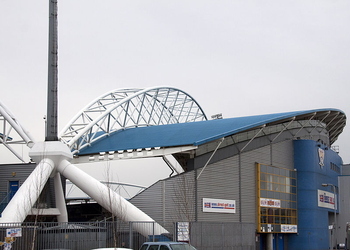 The Graham Taylor Stand - Renamed in 2014 in honour of one of the club’s most successful managers, The Graham Taylor Stand has a distinctive wavy roof and two tiers. 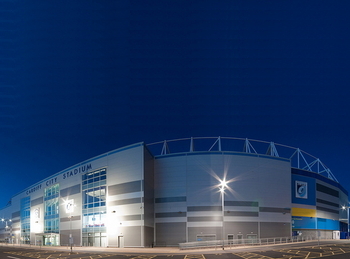 It houses executive boxes and the TV gantry and was partly funded thanks to a loan from Elton John. The Elton John Stand - Named after the famous musician, this stand contains the changing rooms and the tunnel out onto the pitch. 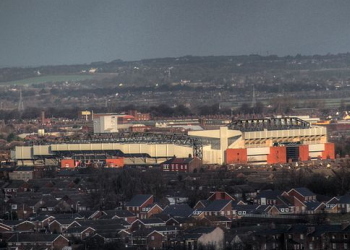 It used to be The Main Stand but when the club was bought by the Pozzo family in 2012 they decided to develop it into a 3000 capacity stand. Where most clubs in the Premier League operate a categorisation system that sees them charge more for tickets depending on the supposed quality of the opposition in any given match, Watford have instead opted for a set pricing structure for all games in the top-flight. They are keen, however, to reward those fans who have supported them during the tough times as well as the good, so they employ a tiered system that dictates who is allowed to buy tickets for the more popular matches. 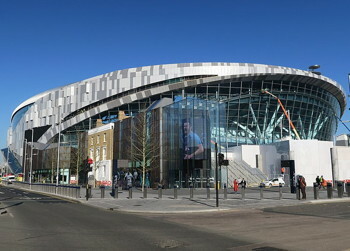 Only those with a certain number of games on their fan card will be able to buy tickets for a match against the likes of Tottenham and Liverpool, for example. Here we’ll show you the cheapest and most expensive tickets for games depending on whether you’re an adult, a concession, a young adult or a fan under the age of 16. The prices do differ depending on which ground you’re in, so do bear that in mind. The club did say to us that “This will be the constant pricing throughout the season depending on whether the club has managed to compromise with the opposition team and get a reciprocal deal which means pricing will be lower than the above”. So if tickets are pricier you’ll know that the other club isn’t playing ball with fair ticket prices! With one of the smaller capacities in the Premier League, it can be tricky to get tickets for Watford games. The first place to start will be the club’s official website; this has all of the details you could possibly need including prices and which stands have how much space. 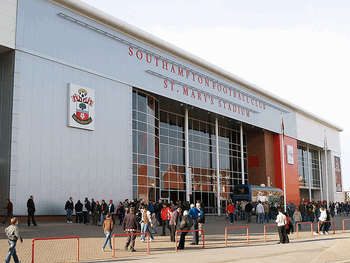 There is also a physical ticket office at the ground and a box office number that you can call. 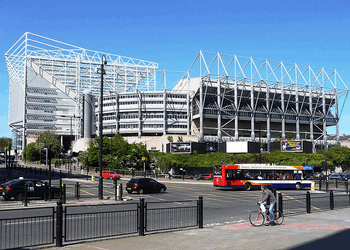 If you see people selling tickets near the stadium we recommend you avoid them as they may be fake tickets. As Vicarage Road is just outside of Central London there are numerous options for travel to the stadium. Wherever you’re coming from you’ll find it easy to get to the Watford gap. Train - Watford High Street Station is just 10 minutes from the ground, so that’s the best place to start. Watford Junction may be more popular for trains from where you live, though, and that’s about 20 minutes away. Watford also has an Underground station and that’s on the Metropolitan Line. It’s about a mile away from the ground. Bus - There are lots and lots of buses that run from Central London to the Watford area and from Watford’s centre to Vicarage Road. Basically, if you want to get the bus to the ground then you’ll be fine. Car - From the North get yourself to the M25 & take Junction 20. Follow signs for Hempstead Road into Watford then get on the A412 until you see the ground. 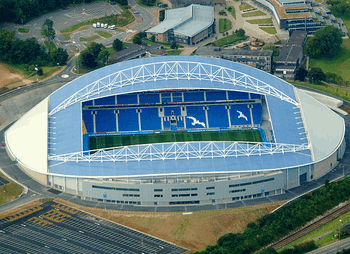 from the South you’ll get on the M25 until you’ve passed the M4/Heathrow exit and get off at Junction 18. Follow the A412 until you see signs for Vicarage Road and then follow them. By Air - Gatwick, Heathrow, Stanstead and London City Airports all serve London so if you’re looking to fly in for a Watford game then you’ll have your pick of places to aim for. Your best bet is to find out how to get to Central London from your airport of choice and then jump on the Metropolitan Line to Watford itself. Taxi - A taxi from Watford Junction Train Station to Vicarage Road will take about 10 minutes, traffic depending, and will set you back about £5. Parking near to the ground is tricky as the car parks closest to the stadium are for hospitality package holders and the like. There’s also no parking in the nearby Watford General Hospital and street parking is strictly reserved for residents. Your best bet is to head to the centre of Watford where there are numerous public car parks. You might also be able to park up at Watford Grammar School for Girls, Cassiobury Park Avenue and Fishers Industrial Estate. 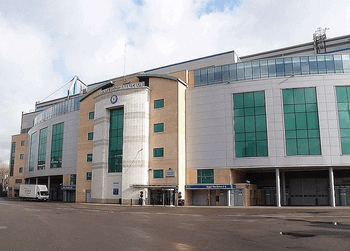 The obvious thing to say regarding hotels is that Vicarage Road is near to Central London, so there are infinite possibilities of locations for your stay. If you’d rather stay a little nearer to the ground itself, however, then read on. The Best Western is about half a mile from the stadium and has a restaurant, laundry service and meeting rooms More details. Located about a mile from the ground, Watford’s Holiday Inn promises a bar, a fitness centre and self-parking. More details. A little bit further afield than the other two hotels at around 5 miles away, Laura Ashley the Manor is the hotel for the more discerning football fan. With a 24-hour fitness centre, a terrace and gardens you’ll be able to unwind before you get stressed watching the match! More details. Branded as a sports bar, Mangans welcomes home fans and serves great ales, wines and alcohol free drinks. There’s no food here, though, so make sure you grab dinner first. The best pub for away fans, this place does good food and all of the drinks you’d expect from a public house. Part of the Sizzling Pubs group, this place offers delicious food and great drinks before the game. They also show live football, should you want to know the other scores before the match. Given that all of the stands at Vicarage Road were re-built after 1990, the facilities are more than adequate. There are places to buy a bite to eat, a pint or soft drink and also perfectly nice toilets. It’s not the Ritz, but you’ll be more interested in what’s going on on the pitch than off it. There are a number of hospitality packages offered by Watford, including the opportunity to sponsor an entire match day at Vicarage Road. Of course such a thing is particularly aimed at businesses hoping to promote themselves, but the club also recommend that it might be a nice family event or birthday treat. 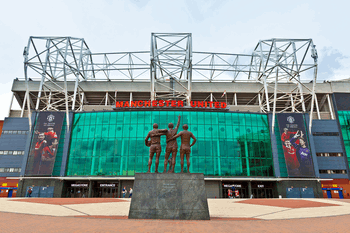 You’ll get to see behind the scenes into the dressing rooms, be given a champagne reception and half a bottle of wine per person as well as a three-course meal and luxury padded seats from which to watch the match. There are also numerous business benefits like your company logo printed in the programme. If you’d rather something less all encompassing then perhaps The 1881 Club is for you. It’s a little more relaxed and informal then sponsoring an entire match day, though you’ll still enjoy a three-course meal, complimentary programme and half-time refreshments. You’ll also get to enjoy the Man Of The Match presentation with the club’s highest scorer and all-time appearance record holder Luther Blissett. 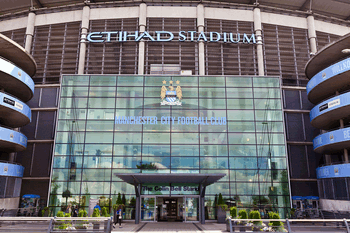 vicarageroadstadium.co.uk is the official website of the club’s private hire and entertainment arm and if they’ve got a dedicated website then they must know what they’re doing. They offer suites like The Elton John Suite and The 1881 Club, plus you can hire syndicated rooms that overlook the pitch and are ideal for smaller meetings or to be used as break out rooms. Maybe you’re not as interested in the corporate events or meetings and are looking for somewhere to have a good old-fashioned knees up? Well they offer that, too. They cater for parties with private bars and catering packages, plus they are also licensed for weddings. Why not spend the most special day of your life at Vicarage Road? At the time of writing it doesn’t seem like Watford offer tours of Vicarage Road or, if they do, they don’t really want anyone to know about it. If you’re particularly keen to have a look around the place then it might be worth email the club and asking them if there’s anything they can do to help them out. Or maybe tweet Elton John. From Elton John to Graham Taylor, Watford have had some famous names associated with them over the years. Under former England manager Taylor they reached 2nd in the First Division and competed in the UEFA Cup. Sir Elton, meanwhile, remains an Honorary Life President of the club alongside Taylor. Under the aforementioned Graham Taylor, who would go on to manage England’s national side, Watford rose from the country’s Fourth Division to the First Division. They came close to winning the league in the 1982-1983 season, finishing second behind Liverpool by 11 points. The finish was good enough to see them compete in Europe for the first time. 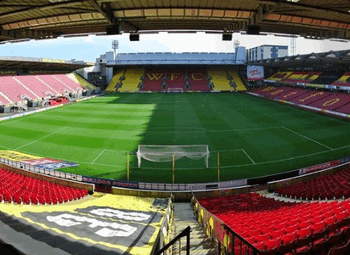 An all-seater stadium with a capacity of just over 21,000, Vicarage Road has been the home of The Hornets since 1922. What a lot of people don’t know, however, is that it was also the home of the Rugby Union team Saracens from 1997 until 2013. There aren’t a huge amount of grounds in the country that can claim to have hosted both football matches and rugby union games in alternation for 16 years! 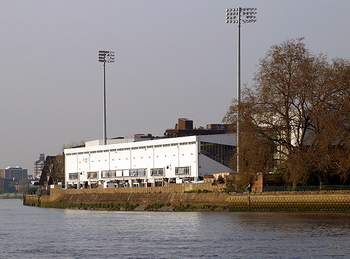 Vicarage Road was also the home ground of Wealdstone Football Club from 1991 until 1993. 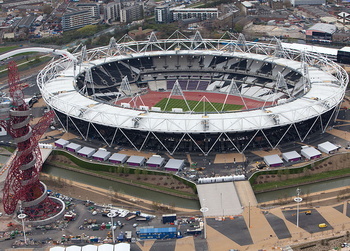 It has also been the location for England Under-21 games and has seen Sir Elton John perform live numerous times. 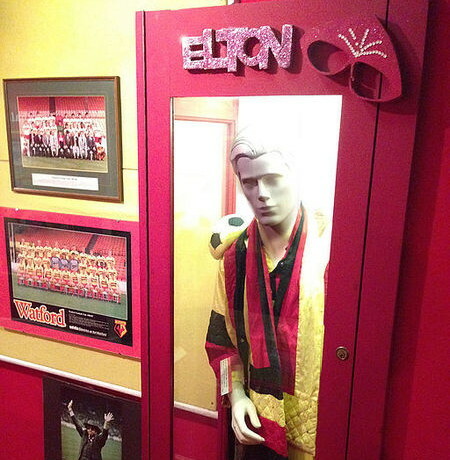 Sir Elton’s relationship with Watford continues to this day and is one of the most famous combinations in English football. Perhaps the connection of celebrity chef Delia Smith to Norwich City is the only other one that comes close! 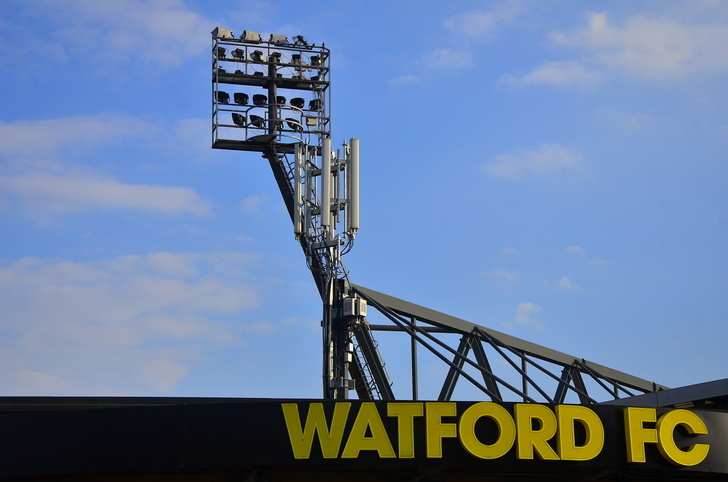 Since the Pozzi family bought Watford there have been numerous developments and improvements done to the stadium. 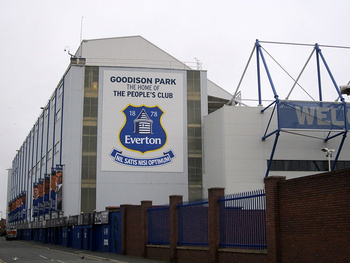 At the end of the 2014-2015 season, for example, some adjustments were made to The Elton John Stand to accommodate an extra 700 seats. 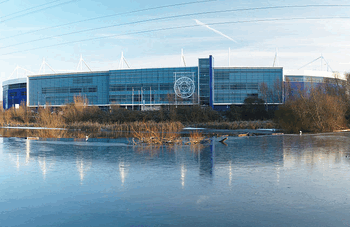 Whilst the club is continuously looking for ways to maintain high standards at the ground there are no immediate plans to develop anywhere else in the stadium.